The principle of sharing is so deeply ingrained in the human psyche that even young children understand that failing to share with others is unfair and unacceptable. Although such a basic understanding of justice and equality has been instilled in our minds since childhood, the practice of sharing is increasingly difficult to observe in a political and economic context where it could have profound implications for the way we organise society. This is especially true at a time when inequality is on the rise, governments are failing to address global poverty, and the planet’s natural resources are being consumed at an unsustainable rate – mainly by the richest 20% of the world’s population. It’s therefore encouraging that a growing number of schools are adopting curriculums that encourage students to discuss the need for sharing resources fairly and sustainably in relation to critical global problems. Once such school in London is St Mary Magdalene Academy, who recently invited STWR to organise a workshop for 7- and 8-year-old pupils to further explore sharing-related themes as part of their ‘Primary Years Program’ syllabus. Through a combination of participatory activities, presentations, storytelling and discussions, STWR’s Sonja Scherndl engaged the children on a range of topics that are central to any discussion about sharing from a global perspective. For example, in order to highlight the injustice of not sharing resources fairly, the children were invited to participate in a cake lottery that could only be won by a single pupil. The game was used to help illustrate the extreme levels of inequality that are a feature of the modern world, where the top 1% of the world’s population now own as much wealth as everyone else combined. The International Baccalaureate study programme adopted by St Mary Magdalene Academy provides students of all ages with a global perspective on how the world works and is organised, and the course has a specific focus on ‘sharing the planet’. Over the course of the school year and across all subject groups, Phelisa Grindrod’s Year 3 pupils will produce a wide variety of work that reflects these core themes. So far, the students have explored a broad range of interconnected issues that pertain to the need for sharing wealth and resources on a global basis such as inequality, hunger, fair trade and environmental sustainability. I am writing to you to make world poverty one of the government’s top priorities. Some people have lived in poverty all their lives. Surprisingly, there are an unacceptable amount of people being denied the basic necessities of life: food, water, medicine and fresh air. I think every person should have access to these basic needs … IS THIS FAIR? One of the reasons are that the world’s resources are not shared equally or fairly. Please could you make this a focus, please put looking for a solution at the top of your agenda. 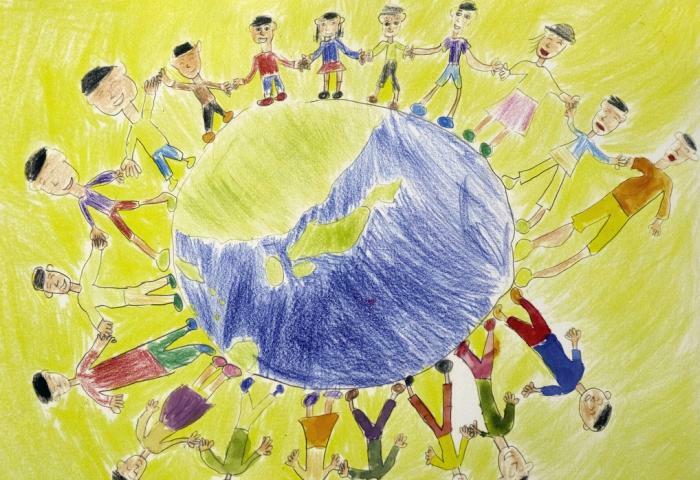 Given the convergence of social, economic and environmental crises that confront humanity today, it’s inspiring to see pupils engaging with these concerns from a young age and calling on world leaders to promote sharing as a common sense solution to pressing global issues. Unfortunately, this simple and urgent message has yet to be taken seriously by those in positions of power and influence. Perhaps it would help if policymakers and business leaders consider going back to school – if only to hear the opinions of these young and truthful minds who instinctively recognise that the principle of sharing holds the key to creating a more equal and sustainable future. When all religions are available to everyone, is that a time of “no religion” ? ← When all religions are available to everyone, is that a time of “no religion” ?